Volunteer Chief Paul Morer is certified to teach the Emergency Vehicle Operator Course (EVOC). During the course ambulance drivers are taught how to clear an intersection, spatial awareness backing up the large vehicle and driving in snow. Calling an ambulance has many benefits over driving to the hospital on one’s own. Ambulances are staffed with Emergency Medical Technicians (EMTs) who are trained in handling medical emergencies, able to provide medical attention on the way to the hospital, prepared to handle the situation if it worsens, able to navigate through traffic much more quickly, able to communicate with the hospital during transport plus aware of the best route to the hospital in addition to road conditions and traffic. “The position of Chief was created in 2018 and my current responsibilities include: complying with Department of Health and Medicaid and Medicare regulations, reporting to the Board of Directors, handling budgetary issues plus long range planning. As Captain, I supervised line officers, the scheduling of volunteers and the training of personnel. I joined as a member in 2004, became a Lieutenant in 2008 and Captain in 2011. As an example, if there was a large incident at the Mall, there may be a need for numerous ambulance crews. I would set up a staging section, triage section, treatment section, transport section and assign officers to head up each area according to the National Incident Command System (NIMS)” Chief Paul Morer told the Rockland County Times. When EMTs arrive at the hospital, the care of the patient is transferred to the nursing staff or trauma team and a report is prepared anticipating what the nurses are going to ask. If the EMTs take an organized approach when transferring the patient to the nursing staff, they can assure the quality and continuity of care and improve the chances of favorable outcomes for the patients. The communications from the EMTs to the hospital staff enables arrangement for a bed, respiratory therapist, x-ray and a warming blanket. Remove soiled linen and place in a bag for laundering. Discard any soiled dressings, bloody material and other contaminated non-sharp waste in the red biohazard bag and leave it at the hospital. Check the vehicles for needles or other sharps and carefully dispose of them in a sharps container. Spray cleaner on affected area and remove any remaining blood or body substances and dispose of toweling in the red bag. Spray disinfectant on affected areas, wipe over area and allow to air dry. The Powered Ambulance Cot reduces the strenuous lifting and risk of back injuries for the EMTs. The powered hydraulic lift raises and lowers patients with the touch of a button. The retractable head section allows the cot to be shortened to any height position. Patient handling on the stairways and other tight spots come with a potential for back injuries that come from repeated moving patients. Narrow or winding stairs put emergency personnel into awkward positions and place stress on back and shoulder muscles. Lift –chairs come with a track-device that allows the chairs with patients to glide down the stairs, eliminating the need for personnel to lift and carry the patient’s weight. 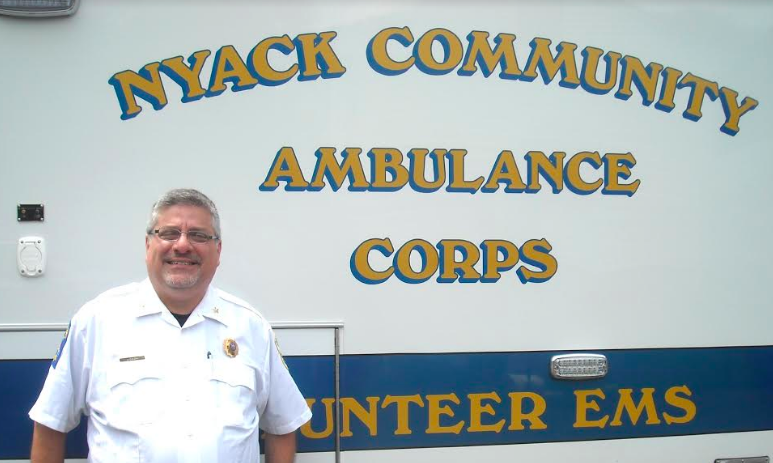 For additional information about volunteering, visit www.nyackems.org or call 845-358-4824.